This complete aeration kit is designed to for a quick and easy install. The compresses is rated to run 24/7 365 days a year though extreme temperatures. It is important to keep it in a dry well ventilated area. The 7 in Membrane Diffuser is self weighted for easy installation. 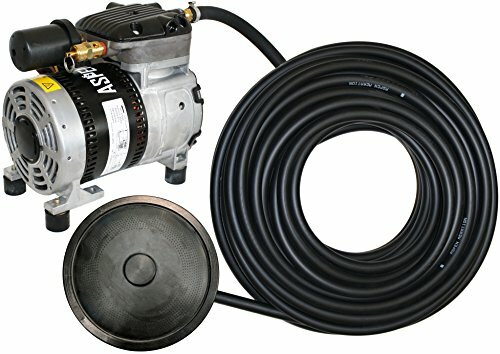 This compressor puts out 2.1 CFM and can operate in ponds up to 50 Ft deep. If you have any questions about this product by Aspen Aeration Systems, contact us by completing and submitting the form below. If you are looking for a specif part number, please include it with your message.